Stand outside any entrance of Los Angeles’ Central Library, look up, and you see only tall buildings, all of them clearly dating from the mid-20th century and later. 611 Place, Aon Center, the twin towers of City National Plaza, and the Citigroup Center all bear the marks of the late 1960s and ‘70s; in the 1980s and ‘90s appeared the Gas Company Tower and, tallest of all, the U.S. Bank Tower, commonly known as the Library Tower. That last gets its nickname not from the presence of public library facilities on any of its 73 floors, but from the source of the air rights – literally, the legal right to build upward into the air – that allowed it rise to 73 floors in the first place. That skyscraper owes its existence to the library, but the library also owes its existence to that skyscraper. The design, both inside and out, makes that purpose explicit. At the top of one staircase a goddess statue has always stood, flanked by a pair of sphinxes and holding open a book whose pages offer a multilingual selection of quotations: the Bible’s “In the beginning was the word,” Seneca’s “Knowledge extends horizons,” Keats’ “Beauty is truth, truth beauty.” Her body bears images of mankind’s progress from East to West: the Egyptian pyramids, the tablet of the Ten Commandments, the Parthenon, Notre Dame, the Liberty Bell, a procession of covered wagons. Her name is “Civilization,” and her creator is Lee Lawrie, a sculptor best known for the forcefully symbolic works made for some of the grander American buildings of the early 20th century, especially the bronze Atlas seen in front of Manhattan’s Rockefeller Center (and on certain editions of Ayn Rand’s “Atlas Shrugged”). Read the whole thing at KCET. This was written by Colin Marshall. Posted on Wednesday, August 2, 2017, at 5:47 pm. 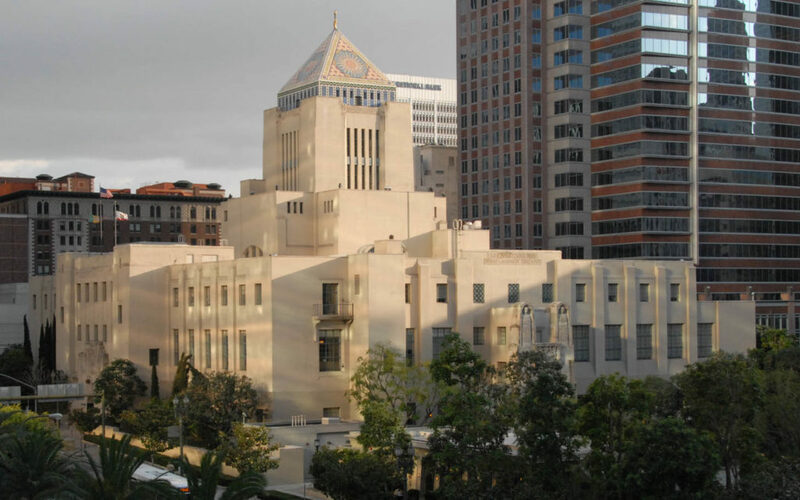 Filed under architecture, Los Angeles, Los Angeles in Buildings. Bookmark the permalink. Follow comments here with the RSS feed. Comments are closed, but you can leave a trackback.